The following article was lifted from the matchday programme – Clapton v Berkhamsted Town 29/04/1986. Mr S.C. (Spencer) Hornsey originally took the job of temporary Treasurer at Clapton FC, a job that lasted more than 30 years!. Andrew Barr had the honour of being invited to meet him at his home in Buntingford shortly before he passed away and they discussed his love for Clapton and his wish for the club to continue and to thrive. Mr Hornsey, who was the brother in law of J.F. 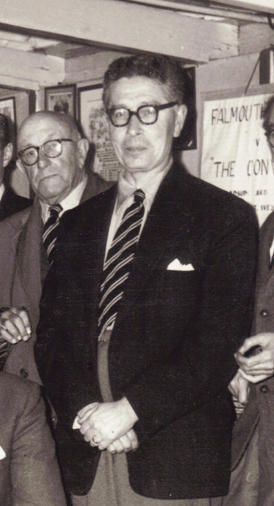 (Jim) Crussell, a Clapton player, England international and icon of the amateur game, was truly one of the greatest administrators in Amateur football. I was born and lived many years within five minutes walk of ‘The Spotted Dog’ and my first schooldays were at Upton Lane School a few yards away from the ground. I have somewhat hazy memories of being taken to a game before the First World War (an Uncle of mine occasionally played for the reserves) and of Clapton winning the FA Amateur Cup, their third success, after the war had started. When I went to West Ham Secondary School, later Stratford Grammar School in 1918, the star footballer was Vivian Gibbins who soon joined Clapton and became an outstanding forward and local hero. By 1922/23 I was a regular supporter and recall an Amateur Cup game with Ipswich Town, then cycling to Erith and Belvedere and being almost heartbroken at a 3-4 defeat in a later round. In this season Ralph Metcalfe (later Clapton FC president) scored five times in the mud at Barking FC in an FA Cup tie and this season was the last time that the Isthmian League Championship came to Forest Gate. In November 1922 I recall travelling to Champion Hill to see an FA Cup replay between Dulwich Hamlet and St Albans City. In this game W.H Minter, a brilliant centre forward scored seven times for St Albans and yet finished on the losing side (7-8!). My reason for going to the game was that Clapton were to play the winners in the next round and the Tons duly won the next game 2-0. In the next round Clapton lost to New Brighton, a club who were about to join the Football League. On Saturday afternoons, one would see streams of people making their way to the old Spotted Dog Ground by cycle, or on foot. There was a cycle rack under the stand and following Clapton became a way of life in the district. The following two seasons produced some unforgettable games. In the 1923/24, the Amateur Cup was won convincingly – beginning with yet another win over Ipswich Town (4-0) and ending with an avenging 3-0 success in the final at New Cross against Erith and Belvedere, the team who had eliminated the Tons the previous year. The six cup games produced 23 goals and only three were conceded. This same year came a great battle in the FA Cup against Queens Park Rangers. The first game at Shepherds Bush ended 4-4 (Clapton had led 4-2 a few minutes from time). However, Rangers won the replay at Spotted Dog 2-0. There was also some outstanding forward play in a London Senior Cup tie against Nunhead where Clapton won 9-0 and, in a league game at Tufnell Park, Vivian Gibbins headed five goals. In 1924/25, Earle was replaced by H,E. Miller, and the Amateur Cup was retained with the outstanding game being a fourth round tie with Hall (Sheffield FC) at the Spotted Dog. The gates were closed long before the start and most of the 9,000 spectators saw a late penalty put us into the semi-final. Clapton FC werenoted for their strict adherence to its amateur status and had several unwritten rules which would seem eccentric today. The team always walked onto the pitch(some with hands in pockets). Referee’s decisions were always accepted without viable comment and there was no demonstration or back slapping when a goal was scored. Tehe scorer would merely acknowledge, with a wave of the hand,the collegue who provided the centre or pass that produced the opening. A sending off was almost unheard of. The normal charge for admission to the ground was 4d (less than 2p in today’s terms) which included Entertainment Tax. There was a small extra charge for a transfer to the stand and league games normally attracted between 2,000 and 3,000 spectators. However when Leytonstone, Ilford, Dulwich or London Caledonians, the top teams of the day, came to the Spotted Dog or if there was an important cup tie, one could expect many more. In 1925, Vivian Gibbins joined Stanley Earle at West Ham United (as an amateur) and Bill (W.I.) Bryant joined Millwall. Clapton recruited new players in R.H. McNeil at centre half and new forwards in R.L. Morgan, J.A. Massey and J.F. Crussell. It was in this season that saw our best ever run in the FA Cup. As Amateur Cup winners we were exempt from qualifying and entered in the first round proper. Norwich City were beaten 3-1 at the Dog with two brilliant goals from Massey and a penalty from Freddie Blake. Our neighbours Ilford were the only other surviving amateur club and the luck of the draw brought them to the Spotted Dog in the next round. Before a packed ground a fierce game ensued which the Tons won with the only goal and Clapton’s reward was a third round tie at home to Swindon Town. The Hammers, who had been drawn away at Tottenham Hotspur, kindly allowed us to use their ground and after a thrilling cup tie before nearly 30,000 spectators, Swindon scraped home by the odd goal in five, aided by a most amazing decision of the referee. However, as there had been no score at half time we claimed that we gone further in the cup then West Ham as they were 3-0 down at half time and went on to lose 5-0. The following year saw us play Brentford, whose team included the great Middlesex and England cricketer Patsy Hendren. The first game at the Spotted Dog ended in a 1-1 draw and in the replay, Clapton were three up in ten minutes thanks to a hat trick by George Osbourne. However, the Bees who were clearly the fitter professional team came back to win 7-3. When the Somerset party alighted from their coach, their manager immediately said to me “What are you doing here?” He was George Burnham, a schoolmaster and played at right back for Clapton before and after the second World War. George used to partner Jim Crussell, who also lived in Ottery at the time, at the heart of the Clapton defence and I was able to get them together for a good chat about old times. I went on to be a Vice Chairman of the Otters, so you can imagine my surprise to see a reference to them in a Clapton programme. Spencer Horney pictured with Andrew Barr at Royston Town v Clapton in 1988.